When it comes to the threat of nuclear war, 2017 is shaping up to be a watershed moment. Relations between the US and Russia — the two foremost nuclear superpowers — has reached a "low point" due to the accusations of election-hacking and the use and harboring of chemical weapons in Syria. Meanwhile, North Korea draws ever-closer to constructing a device that could threaten Washington. The Bulletin of the Atomic Scientists took note of these and other developments in January by advancing its Doomsday Clock 30 seconds. The symbolic shift implies that humanity is now just 2 minutes 30 seconds away from an apocalyptic "midnight." World events since January would do little to improve that outlook. Tensions between the US and North Korea have soared in recent months, with the isolated nation threatening to rain down "nuclear thunderbolts" if the US follows through on rumblings of preemptively strikes — all while it reportedly gears up for another test of a nuclear device. 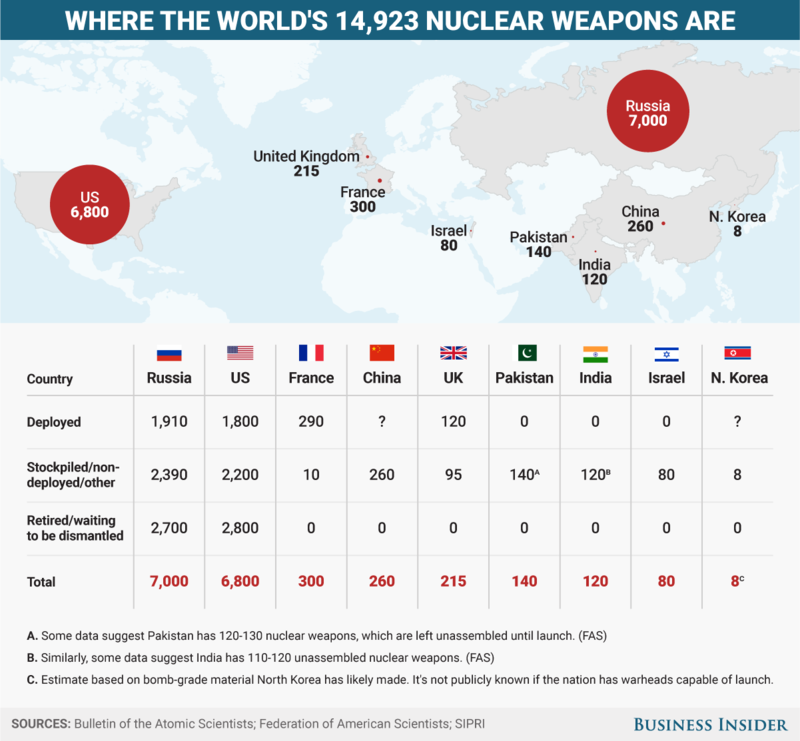 Experts disagree how many deliverable nuclear weapons that North Korea possesses, but more is known about other arsenals around the world. Below is a map that shows the best estimates of which countries have them and how many.